Childish Gambino has announced another new tour for summer 2012 in the USA, Canada, and Europe. The rapper has been on the road almost non-stop since March, capitalizing on the success of his debut LP, ‘Camp’, which The Source gave 4/5 Mics. There probabably hasn’t been such a cross-over talent in the comedy game since Jamie Foxx. And FYI, Gambino’s real name is Donald Glover, no relation…as he raps on Camp. Breaking onto the scene with the single Freaks and Geeks, the former NYU student and current actor on Community has broken onto the mainstage with a top-to-bottom LP with tracks such as Bonfire, All The Shine, Heart Beat and Sunrise being my personal favorites to date. TBD. In the meantime, check out how he got his rap name. 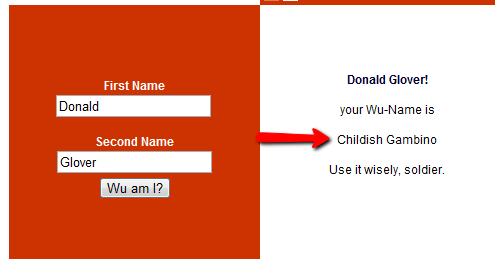 Amazingly off a Wu-Tang name generator. Here is a video of Donald Glover (or is he still Gambino when talking about rap…) finding out about the 4 Mics from The Source. Fire drills, Mr. Brown etc.